State of Cataloging The collection has been fully cataloged and is freely accessible. Painters were a significant group of Ukrainian emigrants in inter-war Czechoslovakia. Many of them studied at Czechoslovakian art colleges, although they founded their own Ukrainian Studio of Fine Arts in 1923. It soon became one of the most acknowledged art institutions in contemporary Czechoslovakia. It offered education in fine arts and applied art and architecture as well. Amongst the founders one can find the well-known Ukrainian historian Dmytro Antonovych. Also professors were outstanding artists. The Studio was accessible for everybody: there were also Czechs, Slovaks and other nationalities. It was closed in 1952. 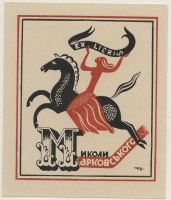 The collection of applied graphics (mainly ex libris) is a part of the collection of art pieces by Ukrainian émigrés, which was founded in 1998 in the Slavonic Library depository. Originally it belonged to the Prague’s Museum of the Struggle for Liberation of Ukraine. The collection contains graphics by students of the Ukrainian Studio of Fine Arts (i.e. Mykola Butovych, Sviatoslav Hordynskii, Volodymyr Sichynskii, Ivan Kulets, Vasyl Krychevskii) and by other Ukrainian artists (i.e. Pavlo Kovzhun, Yaroslava Muzyka). The most frequent ones are works by Pavlo Kovzhun, Mykola Butovych and Yaroslav Muzyka. Authors of some pieces are unclear. The variety and diversity of the collection express plurality of art styles amongst Ukrainian emigrants in Czechoslovakia.